As the first point of contact with your office visitors, your lobby plays an important role in setting a welcoming tone and communicating your brand image. It’s also absolutely crucial to office security. A secure reception area can improve employee safety, protect customer privacy, and even thwart major security breaches. Read on for tips on how to make your lobby more secure. While employees may have multiple options for entry, your lobby can and should be the one point of entry for visitors. Controlling visitor entry is essential to a visitor management policy. This means not only funneling visitors through your lobby, but also making sure that staff members who may come in through other entrances aren’t propping doors open or allowing non-employees to enter the building with them. If you have a solid visitor management policy and your employees are familiar with it, such oversights are less likely to happen. You don’t want unapproved visitors to have uncontrolled access to your employees, company assets, or confidential information. As such, consider allowing only employees and designated visitors to enter office areas beyond the lobby. 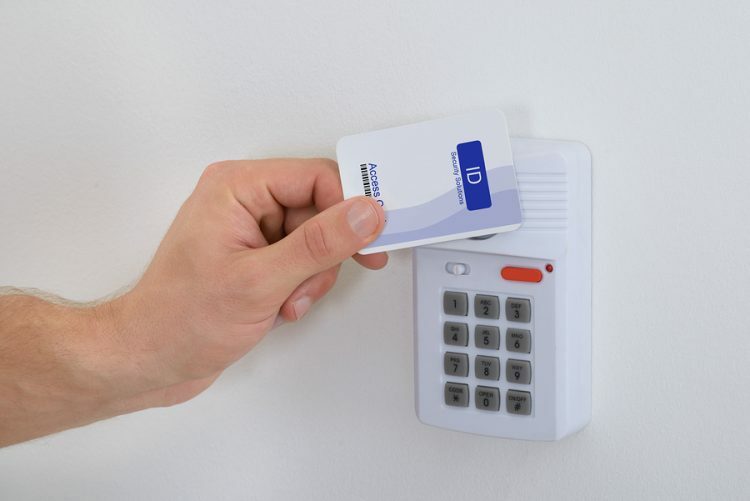 Use technologies like keypads and ID badges to enhance security. Some companies are even experimenting with “smart door” technology that uses smartphone apps for secured automatic access. Visitor logs ensure that you know who’s in your office, when, and which employees they’re meeting with. While a paper log can put customer privacy at risk, a digital log eliminates that risk and also keeps a more accurate record for future reference. Visitor badges also allow you to easily identify who’s in your office. For the best security, provide a unique visitor badge for each person that includes their name, date, and photo. When you use digital sign-in and badging, you can simultaneously capture and store your visitors’ signatures and photos. These measures provide additional ways to verify visitor identity and maintain detailed records. Besides physical security, the security of your company’s information is always a concern. If you require certain visitors to sign privacy agreements before entering your main office, have them sign that agreement up front, before they get past the lobby. Finally, alarms and security cameras can enhance the security of your reception area during both business and non-work hours. Security cameras in particular can allow for greater flexibility in reception. One law firm, for instance, recommends installing a security camera and “hiding your receptionist.” That way, the front-of-office staff can be free to take confidential phone calls and work on other projects without sacrificing lobby security.